Yavni Bar-Yam, Marco Lagi, and Yaneer Bar-Yam South African Riots: Repercussion of the Global Food Crisis and US Drought. New England Complex Systems Institute. arXiv:1307.526, January 8, 2013. High and volatile global food prices have led to food riots and played a critical role in triggering the Arab Spring revolutions in recent years. The severe drought in the US in the summer of 2012 led to a new increase in food prices. Through the fall, they remained at a threshold above which the riots and revolutions had predominantly occurred. Global prices at this level create conditions where an exacerbating local circumstance can trigger unrest. Global corn (maize) prices reached new highs, and countries that depend largely on maize are more likely to experience high local food prices and associated pressures toward social unrest. Here we analyze the conditions in South Africa, which is a heavily maize dependent country, and we find that consumer food indices have increased dramatically. Coinciding with the food price increases this summer, massive labor strikes in mining and agriculture have led to the greatest single incident of social violence since the fall of apartheid in 1994. Worker demands for dramatic pay increases reflect that their wages have not kept up with drastic increases in the prices of necessities, especially food. Without attention to the global food price situation, more incidents of food based social instability are likely to arise. Other countries that have manifested food-related protests and riots in 2012 include Haiti (prior to the impact of Hurricane Sandy) and Argentina. Moreover, these cases of unrest are just the most visible symptom of widespread suffering of poor populations worldwide due to elevated food prices. Our analysis has shown that policy decisions that would have the most direct impact on food prices are decreasing the conversion of maize to ethanol in the US, and reimposing regulations on commodity futures markets to prevent excessive speculation, which we have shown causes bubbles and crashes in these markets. Absent such policy actions, governments and companies should track and mitigate the impact of high and volatile food prices for citizens and employees. CAMBRIDGE (January 8) - It began with a wildcat strike last August. Thousands of South African platinum miners suddenly walked off the job, demanding a tripling of their monthly salaries. The violence began a day later; three miners were killed in the first clash. Then, on August 16, police opened fire on a group of strikers, killing 34 and wounding 80 in the worst civilian massacre since the Apartheid era. Tens of thousands of miners would eventually join the strike and hundreds would be jailed before a partial pay raise was granted in September. A new study by the New England Complex Systems Institute (NECSI) argues that these events — which triggered a bout of national soul-searching — have less to do with labor issues and corruption than the price of food. The strikers’ impromptu demands coincided with record highs in maize, South Africa’s staple grain. "The conditions that give rise to social violence are often poorly understood," according to Yaneer Bar-Yam, president of NECSI and a co-author of the study. "Worker demands for dramatic pay increases reflect that their wages have not kept up with drastic increases in the prices of necessities, especially food. Without attention to the global food price situation, more incidents of food based social instability are likely to rise," he warned. The NECSI paper, "South African Riots: Repercussion of the Global Food Crisis and US Drought," analyzes statistical data to provide clear evidence of a link between the current violence in South Africa and rapidly rising food prices. The authors analyzed conditions in South Africa, a heavily maize-dependent country, to find that consumer food indices have undergone a dramatic increase. 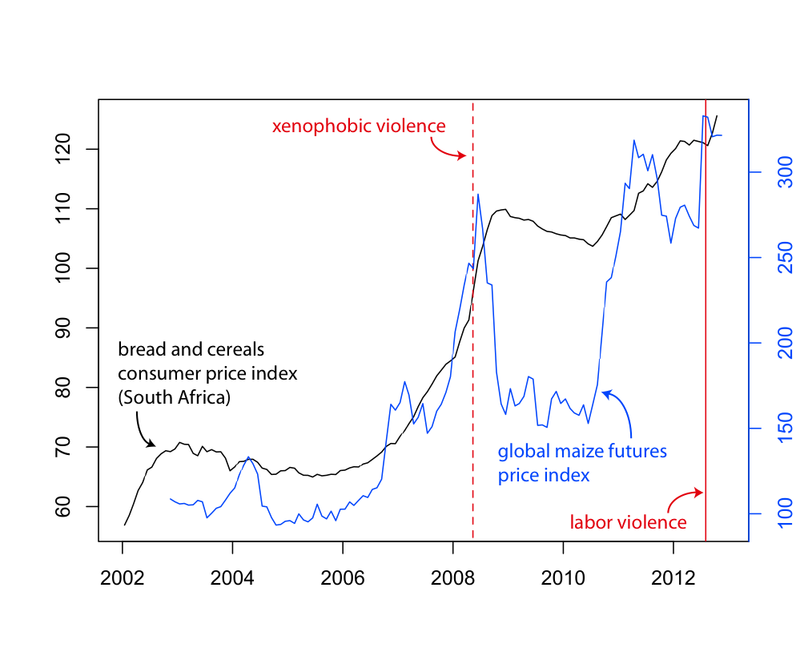 Coinciding with massive labor strikes in mining and agriculture, food prices in South Africa have doubled since 2006 and are strongly associated with observed periods of extreme violence. "Global corn (maize) prices have reached new highs, and countries that depend largely on maize are more likely to experience high local food prices and associated pressures toward social unrest," said Bar-Yam. Map showing different levels of consumption for maize (red), wheat (green) and rice (blue), by country. Consumer price index for bread and cereals in South Africa since 2002 (black, left axis) and global maize prices (blue, right axis). Red solid vertical line indicates beginning of deadly riots in platinum mines, and red dashed line indicates period of severe xenophobic riots. Local prices have increased with global prices but have not correspondingly decreased when prices declined.